Companies that seek to extend their existing on-premises storage infrastructure for data backup and archival or disaster recovery purposes can leverage StarWind Storage Gateway for Wasabi. The solution provides an easy-to-manage and cost-efficient hybrid storage by connecting on-premises backup applications to Wasabi hot cloud using industry-standard storage protocols, like iSCSI. Use StarWind Storage Gateway for Wasabi to securely integrate your on-premises storage infrastructure and migrate your data into the cloud object storage. Easily deploy Wasabi hot cloud storage as an economical and reliable place for backup and recovery or archival purposes and scale as needed without effort. 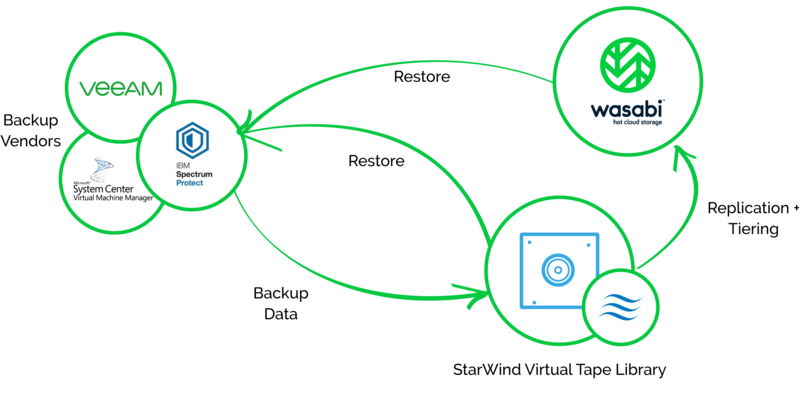 StarWind Storage Gateway for Wasabi seamlessly integrates into any backup infrastructure. In other words, you do not need to change the existing backup and archive processes to keep the backups off-site but still always at hand. Locating, browsing, and restoring the right data becomes a matter of few clicks. The Gateway enables you to comply with regulatory requirements by automating offsite replication and vaulting. By eliminating manual labor you minimize the risk of data loss due to erroneous or malicious actions. Once data is offloaded to the cloud, it becomes immutable and protected from being accidentally overwritten. The solution is not only more economical than LTO, but also far more scalable. With StarWind Storage Gateway for Wasabi, you get an infinitely scalable and instantly accessible hybrid storage pool at a bargain price. Moreover, this backup and archive storage can be quickly aligned with your changing business needs and becomes even more cost-efficient as your company grows.